It’s already April, but I just realized that I never showed you the Christmas present that Mr. Handsome gave me. He’s so good at coming up with thoughtful gift ideas. Several times since we have been married, I have accidentally found out about a gift before Mr. Handsome gave it to me (more on that another time), but this one was a complete surprised. What do you think? I admit that I cried when Mr. Handsome gave me this portrait of myself, along with a sweet note saying that he wanted to paint what he considers to be the most beautiful sight. 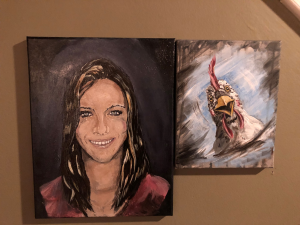 I have to laugh, though, because the picture is currently hanging on our wall next to the crazy chicken that he painted last week. Thank you, Jen! He has a little room where he paints, and he told me that he was working on something, so I didn’t peek in there. What a beautiful painting! He did a wonderful job of capturing your lovely eyes. Thank you for sharing Ellie. Thank you, Jane! Glad you enjoyed seeing it. Have a wonderful day. Yesterday I was gazing at the picture of baby ready to go with Mr Handsome in the post you just did before this current one. The reason I was ‘gazing’ is that I noticed the richness of emotion expressed on Mr H. face. It really is special. Perhaps that picture, even reproduced as a painting, would go good beside this one, imho. 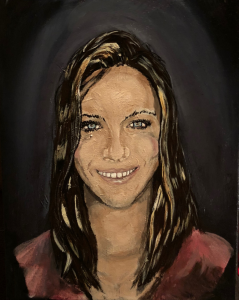 Anyway about this painting, he really captured the beautiful woman he chose. Mr. Handsome did a great job! It looks just like you, and I agree with the above poster about putting the crazy chicken elsewhere and replacing it with a picture of your baby. The picture of you is beautiful. Mr.Handsome did a wonderful job. I love it. Know you need one of the baby, or one with you, Mr Handsome and Mr,Handsome Junior. It’s so sweet how he uses his talents to make you gifts instead of buying them. Knowing all the time and thought he put into your gifts makes them even more special. It would be a neat idea to make one of the baby and one of himself to hang next to yours. Oh that’s the sweetest thing ever Ellie! He is VERY talented to do that good of a portrait! It is definitely you…what a keepsake for the rest of your life! transform into a hen pecking nag! Mr Handsome has captured you beautifully, what a lovely and thoughtfully gift. Also I love the crazy chicken picture it is so characterful. You forgot the water mark. That is very impressive! How long did it take him to make it, and has he painted people before? He did a great job! Thanks, Anne! It took several days, with him working on it a couple hours each day. Beautiful and so accurate. Mr. Handsome is a talented man. WOW Ellie!!! Mr H, really captured U, and other pic is fowl!!!! Mr H’s painting have great energy about them, and that’s what I love about them!!!!! Ask him, how the “cow” 😉 is he, LOL!!!! How Mr h doing, I love U 3??!! Thanks, Justine! The cow is doing well. LOL. Thank you, Denya! I’ll share your words with my husband. Have a lovely day. Mr Handsome is very talented..